Not to fear we have 6 tips that will help you shorten the duration of your symptoms if you’ve catch it or prevent it altogether! If taken within a day of the first symptom it can cut the length of the cold by 24 hours. Sugar is “fertilizer” for bacteria, yeast and fungi which can setup your immune system up for a respiratory virus attack. 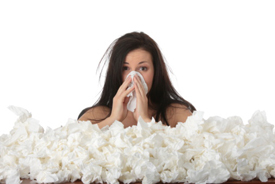 Regular chiropractic care is another great way to keep the flu and cold at bay. Having regular adjustments and treatment will ensure your body is working optimally.